John McAslan + Partners is one of Britain’s most respected and dynamic architectural practices, with projects in the United Kingdom, Europe, North Africa, Asia and the United States. 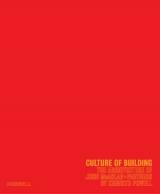 Culture of Building provides an up-to-date account of the work of the McAslan studio (which celebrates its twentieth anniversary in 2004) and detailed, fully illustrated descriptions of many recent and ongoing projects, from the Volubilis visitor centre and museum in Morocco and the extension of Frank Lloyd Wright’s Florida Southern College campus to educational buildings in London, Manchester and Southampton and a major office scheme in the City of London. Written by Kenneth Powell, the book examines the development and philosophy of the practice, which has a particular reputation for renewing and transforming historic buildings, and looks at the way in which a vision of history has informed its highly innovative approach to new design. Culture of Building analyses the culture of an office that has made a unique contribution to the architectural scene worldwide. Kenneth Powell is an architecture critic and journalist based in London. He contributes to newspapers and journals in Britain and abroad and is a former architecture correspondent for the Daily Telegraph. His many books include studies of the architecture of Norman Foster, a two-volume study of the work of Richard Rogers and a monograph on Will Alsop, as well as several titles for Merrell. He was elected Honorary Fellow of the Royal Institute of British Architects in 2000.